Do you struggle with smartphone addiction? 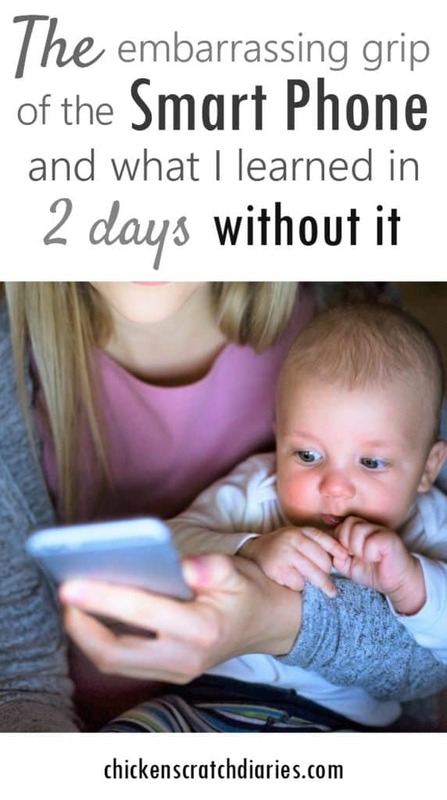 I didn’t realize just how powerful the grip was, until I became a mom and I started to see some of the not-so-great effects it was having on my daily life, and my family’s. I look back a little wistfully on earlier decades – the ones where smart phones didn’t exist. Maybe you remember those uncomplicated days as well. As they say, ignorance is bliss! When my husband and I first were married 16 years ago, we didn’t even have cell phones for about the first year of our marriage. Some of our friends and family did, but it was kind of a new and optional thing at the time (especially in our rural area). We lived in a tiny rental house and had a basic landline and dial-up internet – and that was only because we were both in college and felt it was a necessity. I remember being adamant at that time that we didn’t need the added expense, and my husband was fine without a cell phone too. But eventually we had to catch up with the times, and work and commutes brought us to cell phone ownership. And from the beginning, I was leary of the thing. I think I somehow knew that my phone was just a huge life-disrupter waiting to happen. And we didn’t even have internet back then! Texting was not even popular yet. But the idea that people could reach me anywhere, anytime, was a little unnerving to me. Also perplexing was that I felt so obligated to answer it whether it was really convenient or not. I kept up my love/hate relationship with my phone for years and my husband and I were about the last two people in the universe to get smart phones. My family made fun of me for a long time because they thought I was just too cheap to join the 21st century and learn how to use a smartphone (and yes, texting too). Fast forward to today, I’ve long since learned to use a smartphone and although I’m still too cheap to keep up with all the latest models, I’ve adapted pretty well. My phone, as I always suspected it would be, is a time-sucking black hole of epic proportions. I knew it down in my soul from the moment we signed that first contract. If you ask me, I’m quick to say that I am not on my phone much, that I avoid it. But it has become, over the last few years, my default activity. I watch very little TV these days, but surely make up for it by the 5-10 minutes here and there, all day long, checking my email, Facebook, and whatever other notifications are constantly beckoning for my attention. Granted, I work mostly online now and there are times it’s a necessity. But when I’m honest with myself, the phone habit leads to far more time spent than just working. It’s truly a love/hate relationship- I hate what my time spent on my phone does to my life, but I must apparently love whatever I’m doing on it because it sure is a hard habit to change. Not long ago, when my phone completely stopped working after a tragic hardware malfunction, I panicked for about 3 seconds. That’s about how long it took for me to realize there was nothing I could do about it until I could get a new one in a few days, and I’m nothing if not practical. But there were other revelations I came to in those two days of unconnected bliss. First, I was less anxious without my “device” lurking at my work desk, my kitchen table, my countertop, my car console, in my back pocket (where I would inevitably sit on it 6 times an hour). A weight was lifted — like I had returned to my pre-2002 anonymity for a moment, and I actually felt a little sneaky about it. In addition to having a strange new sense of independence, I started to suspect that I actually do have time to do a lot of the things I’m always saying/telling myself I don’t have time to do. When I thought about how many things I used to enjoy that I’ve slowly “lacked time” for, it was pretty sad. Like how I’m always lamenting that I never have time to read anymore. You might even catch me from time to time, walking past my bookcase in the living room with an outstretched arm, whispering, “somedaaaay“. But I wonder how much of that is because my attention span has been retrained to last no longer than the length of a text message or a sound byte on Facebook? And it’s not just reading. I’m seriously wondering how much I’ve missed out on in life, in general, after being hooked to an electronic gadget a good chunk of my waking hours over the last 10+ years. 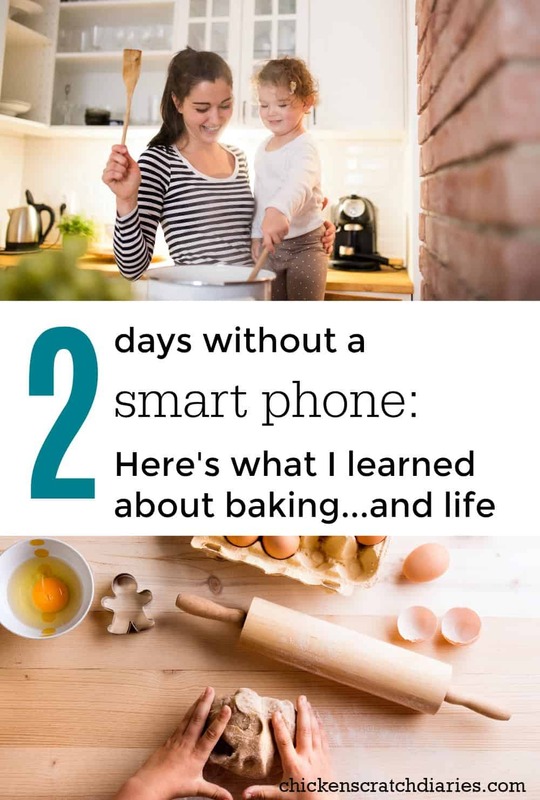 I probably could have gotten a doctorate degree, taught my children a second language or at least figured out how to set the clock in my van, if it wasn’t for smart phones eating away my precious time. The biggest breakthrough in my short-lived tech-free sabbatical came whenever I got my new phone activated and caught up on my messages and calls. There were actually only a few that were of any importance. On a scale of one to ten, what I missed out on ranked about a one. The truth is, people don’t really need me as much as I think they do. Let me clarify: The people that need me the most — they’re right in front of me. And they need to take precedence over anyone else who needs to reach me through a phone. I’m pretty thankful my phone bit the dust when it did, and pretty embarrassed that I didn’t reach some of these conclusions a lot sooner (or at least acknowledge them). It’s made me a lot more intentional in how I ration my time between virtual relationships and the real, in-person bonds that truly fill my cup. I am also finding that my stress level is a lot lower when I take some time to do things that I really enjoy, instead of constantly thinking I’m missing out on some piece of information – or feeling obligated to everyone and everything else outside of my family and those closest to me. I’ve often said I don’t like to bake because I don’t have the time, but you know what? My kids and I have been baking a LOT lately. It’s way more fun than surfing Facebook. And my hope is that when my kids think back to these days, they’ll remember me — not with a cell phone, but with a mixing spoon in my hand. • Are You Intentionally Spending Time With Family- or Just Marking Time? Love this, so true! I was about the last person I knew to get a smart phone. I’ve only had one 3 years. I am surprised too how much time I waste on it. I try to stay off as much as possible when the kids are awake but sometime I just need a little connection to the outside world! It’s so hard isn’t it?! I need that connection too, just in smaller doses, I’ve realized. 😉 Thanks for stopping by Sara!